Yes, SoDak Stump Removal is Fully Insured. Will you call 811 to located utilities? YES! SoDak Stump Removal will call for utilities to be located, and flags will be placed within 48 hours. 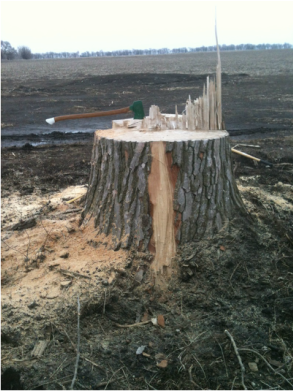 Stumps can be rotted out using chemicals, but the process takes months or even years. The wood must become rotten enough to break apart for disposal. The fastest and safest method is by using stump-grinding machines that grind the stump down into wood shavings. When a living tree is cut and the stump is left behind, the tree still survives as long as the sugars that it uses to survive are present. This is why some times a stump will regenerate shoots trying to grow again. Once the stump is ground below grade, in most cases, it will not begin to grow back. In rare cases, some species of trees allow the roots in the surrounding area to sprout themselves. Usually they rot away, but in rare species that can sprout. These small sprouts can be easily pulled by hand. Once the stump has been ground, the hole will be filled with the mulch (shavings/chips) from the stump, unless you pay an up-charge to have the much hauled away. If the stump is 15'' or greater, I HIGHLY recommend that the grindings are replaced with black dirt. What must I do after you leave?